Accessible Way (Rota Acessível), a new smartphone app in Brazil, allows users to report accessibility problems they encounter in cities. 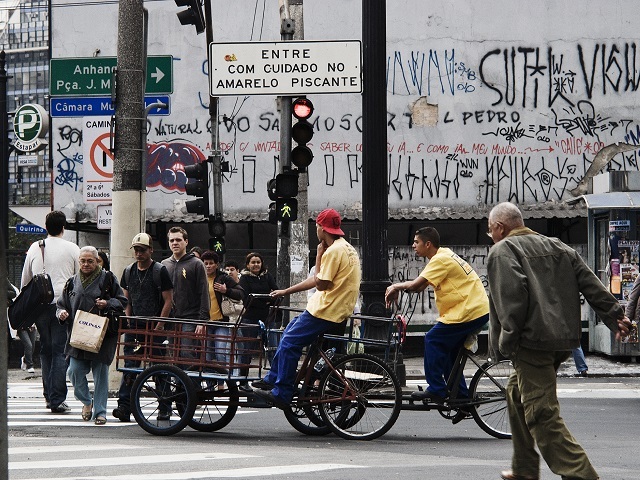 The app’s creation is an innovative way to identify the main accessibility challenges of Brazil’s urban residents. Photo by Gustavo Gomes. Urban residents worldwide encounter a myriad of accessibility challenges every day, many of which pose particular challenges to individuals with disabilities. In an effort to identify these daily challenges, a partnership between the Association for Assistance to Disabled Children (AACD) and IBM recently produced Accessible Way (Rota Acessível) – a free smartphone app designed to carry out a survey of accessibility in the streets of Brazilian cities. The app’s creation is an innovative experiment that will hopefully shed light on the extent and nature of urban accessibility challenges in Brazil. The goal of the app is for users to share accessibility difficulties they encounter in their daily paths, helping to build a knowledge base on urban mobility in Brazil. The platform offers a number of categories for people to tag and report problems they observe, including special places, sidewalks, ramps, street lighting, traffic lights for pedestrians, pedestrian crosswalks, and visual signage. This screenshot of the Accessible Way app displays the location of various reports of urban accessibility challenges categorized by color. Yellow, the most prominent color, represents sidewalk challenges. Blue stands for special places, green for ramps, purple for traffic lights for pedestrians, and red for pedestrian crosswalks. Photo courtesy of Rota Acessível. When a user selects a topic they wish to report, they must also submit a photo in order to ensure the information collected by the app is accurate. Their report is then added to the aggregated stock of submitted data, which is arranged in graphs that can be viewed by any user. The user friendly design of Accessible Way is a platform through which the main accessibility needs of Brazil’s urban residents will hopefully be identified, and eventually addressed. Photo courtesy of the Apple Store. While developing this new platform, the IBM Brazil research library employed technologies for mobility, collaboration, and data analysis in order to generate a smart and reliable survey. The purpose of the application is to identify the main accessibility needs of the population and form a database that can be useful to institutions that work in helping people with disabilities. The potential impact of this new app is considerable – crowdsourcing has already made its mark on many industries ranging from marketing to mapping to social media – is urban development and accessibility next? This post was originally published in Portuguese on TheCityFix Brazil on October 24, 2013, and inspired by an article from Catraca Livre.